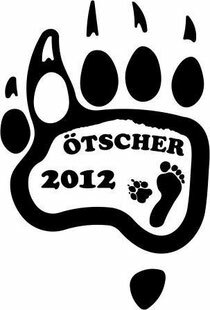 ÖTSCHER-DT English - hundunderwegs Jimdo-Page! Ötscherwiese 18, A-3295 Lackenhof am Ötscher, AUSTRIA. In this two days you will walk or run through the forests and above the timber-line around the so called magic mountain „Ötscher“, through the canyons of the Ötscher-rivulet by passing waterfalls and last but not least you will dive up into the darkness of the Ötscher-stalactite cave. Additionally Trekker will be able to catch a view over their done trail from the summit of the Ötscher. 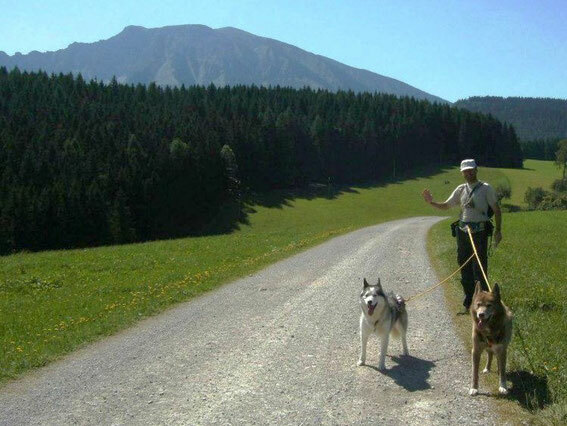 DOGTREKKING: about 47 and 38 km with 3300 and 2600 m difference in altiude - starts at both days from 07:00 o´clock. DOGHIKE: about 26 and 23 km with 1800 and 850 m difference in altiude - starts at both days from 08:00 o´clock.
) in your tent, caravan or also in a room there. Help yourself if you want to sleep in a room. Mandatory equipment: Headlamp with extra batteries, mobilphone, one liter water for you and one for every dog, spare food for you and your dog(s), bowl(s) for dog(s), map (you will get in the meeting), first aid kit, two booties for every dog, gloves and cap (alpine terrain! ), rainwear, insurance for you (accident i.) and your dog(s; liability i.). The equipment will be controlled. , massage, contribution to maintain the footpaths, organisation and instead a piece of paper (diploma) an embroided T-shirt of this event (so we need your size for T-shirts, S/M/L/XL, with you registration). The campingsite-fee and consumptions are NOT included. - and please add the remark "Ötscher + your own name". - Late registrations (unfortunately without T-shirt) can pay at the meeting. Veterinary appointments: Valid vaccinations at least one month old, the dog(s) has/have to be at least 18 months old. Name und surname, your size for the T-Shirt, date of birth, name of the dog(s) and distance (DT or DH). A participation follows an invitation of „Dogtrekking & More“ and is possible from the finish of the 14th year of one´s life. Up to the finish of the 18th year of one´s life a declaration of one parent is necessary. Please only compulsory registrations! Notice: The participation is allowed with one or two dogs of every breed and a minimum age of 18 months, if the animal(s) is/are in accordance with the physical and psychical demands of the event. In every moment of the event the supervision over the dog(s) has to be given (dog(s) permanently leashed, no "Flexi"-leads). THE PARTICIPATION HAPPENS AT YOUR OWN RISK. Participants bear liability for all damages caused by themself and his dog(s). Additionally special thanks to ManMat for the great help to make the small amount of our emroided t-shirts possible at low costs!!! The Team of DOGTREKKING & MORE is looking forward to your comming!